For a refreshing taste of summer, whip together this super-simple and quick recipe of prosciutto wrapped shrimp. These attractive kebobs can be passed out to guests as an appetizer or served alongside fresh pasta or salad. Fresh ripe peaches delight the senses, so be sure to get them ripe! The herbaceous chive brings out the natural sweetness of the prosciutto wrapped shrimp, and the creamy Greek yogurt adds a luxurious touch. This dish delivers a perfect harmony of seasonal ingredients. Soak wooden skewers in water, about 10 minutes. Clean the prawns and leave the tails on. Wash and dry the peaches and cut into wedges. 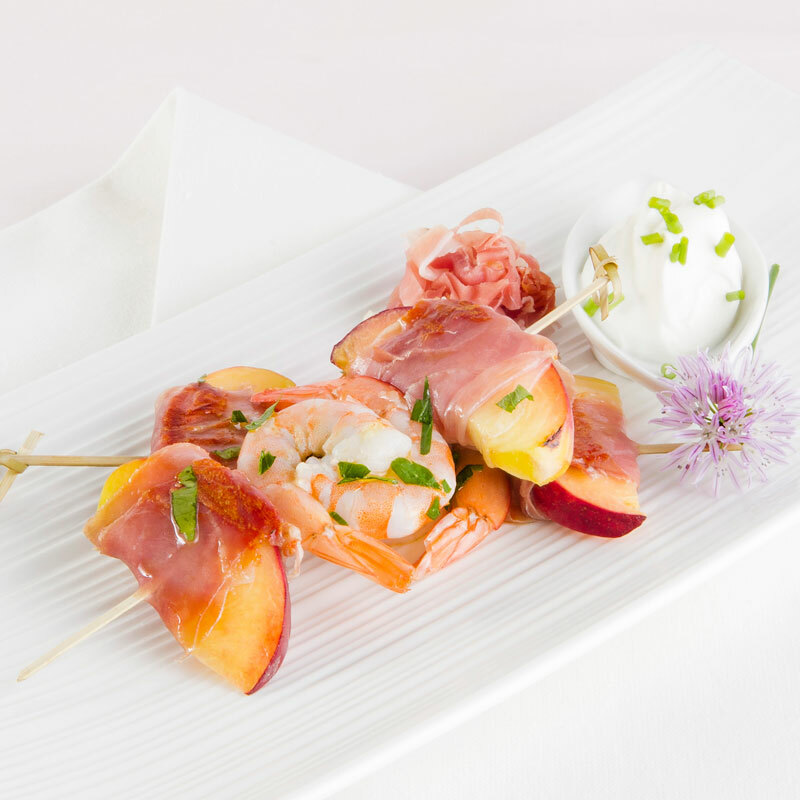 Wrap the peach wedges with slices of Prosciutto di Parma. Thread a peach wedge, a prawn, and then another peach wedge onto toothpicks. Prepare the kebabs until all the ingredients are used up. Grill the kebabs on a hot grill; season with salt and freshly ground black pepper. Remove from grill when prawns are fully cooked. Whisk mint and olive oil; drizzle over kebabs. Chop the chives and mix into the Greek yogurt. To serve, on 4 plates place 2 kebabs on each with 2 heaping tablespoons of the Greek yogurt and chive mixture. Serve kebabs warm.